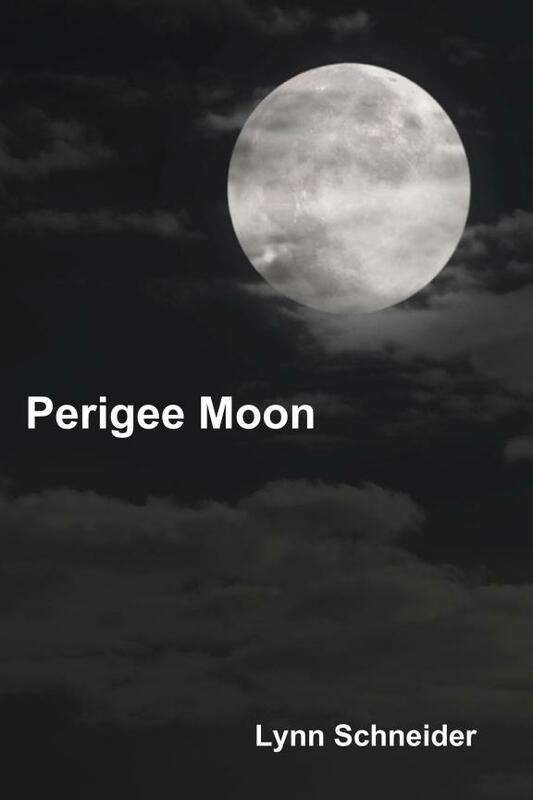 The following is another section from Perigee Moon. Kate is trying to break up Luke and Abby. She has accosted Abby in the grocery store and convinced Abby to have lunch with her, where she proceeds to lie to Abby about a dire diagnosis she has just received, and appeal to Abby’s compassion and selflessness to break it off with Luke so Luke and she (Kate) can be together again. She has taken Abby’s cell phone and texted him with it. Luke thinks it’s Abby texting and breaking it off with him, which is why he didn’t go to Abby’s house after work, as he has been doing every day for several months. Here’s Abby at home. Luke hasn’t come and there is no word from him, which is making her assume a lot of things. When she wakes it’s seven o’clock. She’s been alternately crying and sleeping for hours. Her head aches, her eyes are swollen, and she feels heavy as if she can’t move her legs over the side of the bed to stand up. But she does and goes to the bathroom and starts the water running in the big tub, adds some bubble bath and lights candles. It’s dark already. She hears rain on the window. The wind gusts and rattles the screens. She’ll have to put the storms down soon. It’s a hard job and one she dreads, and she had been planning to ask Luke to help her with it. Thinking of him brings fresh tears to her eyes, which are already scratchy. They’ll be swollen for a day or two. She remembers how it had always been. Go on a good crying jag and it’s cathartic while it’s happening but you’ll pay for it the next day. She decides to get a glass of wine, goes downstairs and there is a half bottle of Cabernet on the counter, opened last night. She takes a glass and the bottle. This could be a long night. A long, cold November night. She’d thought it possible he might come out like always, and they’d discuss it and then she’d tell him about the lunch with Kate and she wouldn’t assume everything was over between them. If he wanted, or needed, for things to be over between them then she’d let him tell her that. He didn’t come. It’s past seven, he should have been there over an hour before so she knows. He won’t be coming. He’s with Kate. Kate’s got to him and he’s succumbed. Otherwise, he would have been here as he said he would. He’d never before said he’d be there and then not showed up or at least called to say he’d be late. Something is wrong and Abby knows what it is. He doesn’t have the guts to face her. That’s why he hasn’t come. So much for the vows of honesty between them. Maybe it was too much to hope for, that there could be honesty when it comes to leaving a girlfriend and returning to a wife. She’s never thought of herself as his girlfriend. She had never been anyone’s girlfriend really, and it would have been nice to contemplate the status of girlfriend back, oh eight hours or so ago, before things had changed so much. Now she is no one’s girlfriend and no one’s wife and no one’s significant other. She is back the way she’d been before June. Alone. Alone with Milly and Buzzer, her only companions in the evenings. The crazy lady who talks to dogs. Kate had said Luke belongs with her. He will never belong with Abby. No, he belongs with, and to, Kate. And she wonders, now that Kate has said she wants him back, does he realize that was what he’d wanted all along? Kate is the mother of his children. A big draw for any man, she knows that. It’s why John could never completely commit to her. And Luke won’t be able to either because of that shared experience that she can never give him. The gift of a child, with the melding of chromosomes, half his, half Kate’s. And Kate might be sick, really sick, and she wants him back. How can she, Abby, stand in the way of that? This entry was posted in Boomer Lit Friday, Writing and tagged boomer-lit, Perigee moon by Lynn Schneider. Bookmark the permalink. I once wrote a massive manuscript 1200 pages long entirely in italics. Publishers don’t like it. Well. The italics were there only to be separated from the rest of the post. In the book, it was not italicized. Love the mood – sad,dark, reaching for hope and then pushing it away, trying to accept her loss. Well done. No, Kate was pretty nasty really. She was just one of those women who thought no matter what she would always prevail. Very atmospheric and moody. Well done. Thank you Kathleen. I tried to set a mood here so glad you liked it. I really liked this. Makes me want to read more. Thanks. Well, I sure wish you would read more! Thank you. Abby is Abby. She is the opposite of Kate, which is why Luke loves her. I liked writing Abby so much. She is very appealing, I think. Such an awful betrayal. I feel so sorry for Abby. Makes me want to read more.